This clock was made in 1564 by a famous German clockmaker, Jeremias Metzger (or Metzker), of Augsburg. This form of clock with a vertical, circular dial on a footed base is known as a 'monstrance' or 'mirror' clock for its similarity in shape. Such clocks were popular in Europe between 1580 and 1630. Their cases were usually of cast and chased bronze or of cast and beaten copper and brass sheet. The cases were commonly gilded (coated with a fine layer of gold). The movements are similar to those of a table clock. This clock should not be seen simply as a functional household item but more as a treasury piece, bought primarily for its craftsmanship and technical ingenuity. By the 1550s it was fashionable for wealthy gentlemen to have a sound understanding of all branches of learning, from art and literature to mathematics and the natural sciences. Clocks such as this were housed alongside automatons and scientific instruments such as astrolabes and sundials in Scientifica, collections celebrating human ability to control nature. Clocks were luxury items designed to impress as well as educate. Clockmakers like Jeremias Metzger served an aristocratic clientele. 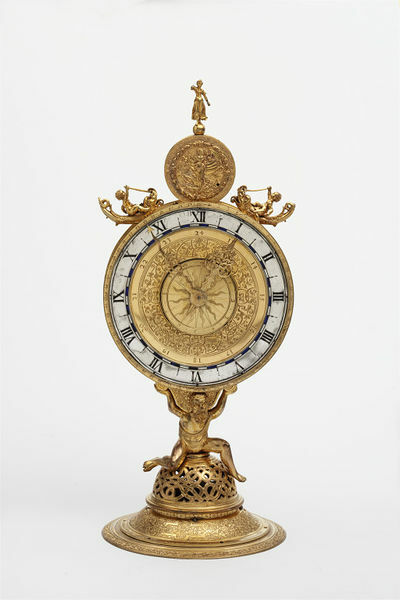 One of Metzger's clocks, also dated 1564, and now in the Kunsthistorisches Museum, Vienna, is probably the same clock as one described in an inventory of the collection of Archduke Ferdinand II. In the 1570s Ferdinand extended his castle at Schloss Ambras in Austria to house his large collections of arms and armour and works of art. The Kunstkammer which housed the latter, included a cupboard specifically for clocks and instruments. An upright chiming table clock of monstrance (or mirror) form. The low circular base rises gently to a curved section which is surmounted by a dome-shaped pierced casing enclosing a bell mechanism. A cast figure of Atlas sits astride the dome with raised arms and palms supporting a shaped, engraved bracket which is adjoined to a circular clock case. The recessed flat sides of the clock case are finely chased with a triumphal procession. The clock is fitted with 3 dials, (2 on the front, 1 on the back). The upper centre of the clock case is surmounted by a medallion-like case with pierced sides featuring an alternating scrolling foliate and animal pattern. The front of the case features a finely chased wreath bordered image of a chased figure of a draped female form standing on a fish and holding a sail surrounded by an engraved border. The back features a chased figure of a draped Justice holding a sword and scales set within a finely chased wreath border and outer pierced, chased and engraved border featuring alternating foliate and creature pattern incorporating a [stag or antelope], owl, unicorn and eagle. The upper shoulders of the clock case are each set with a single cast putti astride a dolphin, each holding a trident attached to the upper beak of each dolphin and right arm of each putti. The back is modern. 'Jeremias Metzger Clockmaker 1564 in Augsburg'. The maker, Jeremias Metzger (or Metzker), was a clockmaker born in Augsburg in 1527 and working from 1555 to around 1575. He died in around 1599. The Museum bought this clock in 1857 for £30. Susanne Thürigen explains that the term 'monstrance' clock was not used by the clockmakers in the 16th and 17th centuries. A mid-17th century hand written description by by Caspar Langenbucher of his table clock today preserved in Brunswick (Braunschweig) is entitled 'Account and Description of the Mirror Clock and Masterpiece of Augsburg master craftsman'. Langenbucher was trained in Ulm. The 'monstrance' or 'mirror' clocks made in Augsburg often had rich astronomical and calendar details. This form of clock with a vertical, circular dial on a footed base was first mentioned in an inventory of the Emperor Charles V and was popular between 1580 and 1630. Housings for clocks were usually of chased cast bronze or partly cast and partly beaten and gilt copper and brass sheet. The movements are similar to that of a table clock. This clock should not be seen necessarily as a functional household item but more as a treasury piece, bought primarily for its craftsmanship and technical ingenuity. By the 1550s it was fashionable for wealthy gentlemen to have a sound understanding of all branches of learning, from art and literature to mathematics and the natural sciences. Clocks such as this were housed alongside automatons and scientific instruments such as astrolabes and sundials in Scientifica, collections celebrating human ability to control nature. Clocks were luxury items designed to impress as well as educate. Clockmakers like Jeremias Metzger served an aristocratic clientele. One of Metzger's clocks, also dated 1564, and now in the Kunsthistorisches Museum, Vienna, was probably in the collection of Archduke Ferdinand II. In the 1570s Ferdinand extended his castle at Schloss Ambras in Austria to house his large collections of arms and armour and works of art. The Kunstkammer which housed the latter, contained a cupboard of clocks and instruments. 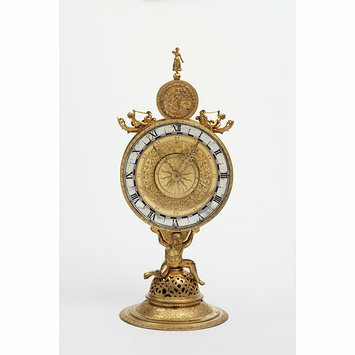 An inventory of the collection describes a clock very similar to the one now in Vienna. (see: Impey, O and MacGregor, A. The Origins of Museums (Oxford: 1985), p.36). Maurice, Klaus and Otto Mayr, eds. The Clockwork Universe: German Clocks and Automata 1550-1650. New York: Neale Watson Academic Publications, 1980. Catalogue of the exhibition held Bayerisches Nationalmuseum, Munich, 15 April - 30 September 1980 and Smithsonian Institute, Washington DC, 7 November 1980 - 15 February 1981. ISBN 0882021885.